Wile E Coyote explains the bedroom tax to landlords…and not before time! The message that legal aid remains for many areas of law is not being heard. A new poster campaign aims to address the problem. Legal aid is still available – but it seems that the government is not enthusiastic for the public to get the message. Since the implementation of the Legal Aid, Sentencing and Punishment of Offenders Act in April, which removed legal aid for huge swathes of advice areas, the take up of legal aid for cases that remain in scope has been much less than the Legal Aid Agency expected. Hugh Barrett, the agency’s director of commissioning told the Legal Aid Practitioners Group conference that the take up of legal aid was significantly lower than the LAA had expected post-LASPO. Last month, the Gazette reported that referrals to family mediation – the government’s flagship solution to the removal of legal aid – had plummeted in the three months from April to June 2013. The number of couples attending MIAMS (mediation information and assessment meetings) fell by 47% and the number of referrals to family mediation dropped by an average of 26%. Whatever the government claims about information being available on its website and through the telephone gateway, the message that legal aid remains for many areas of civil and all criminal law is not getting through. A cynic might suggest this is what the government wants, keeping provision a secret will allow the Ministry of Justice to keep more money in its ever-shrinking kitty and give it the opportunity to claim that the demand for legal aid is falling, so it is right to cut funding. The problem with this strategy is that it means many people are missing out on legal advice and being denied access to justice to enforce their rights. It has been left to the Legal Aid Practitioners Group to step in to help rectify the situation. The organisation, which operates on a tiny budget, has paid a designer to put together a poster informing potential clients about the areas of law that are still eligible for legal aid. Printing company Rap Spiderweb produced an initial print run of the posters for free and firms and advice centres can pay for additional copies to display. All credit to the LAPG for producing it – it is undoubtedly a useful tool to help clients understand their entitlement to legal aid, but surely this should have been done by the government. The government is changing the rules to make it harder for disabled people to appeal when it takes away their benefits. 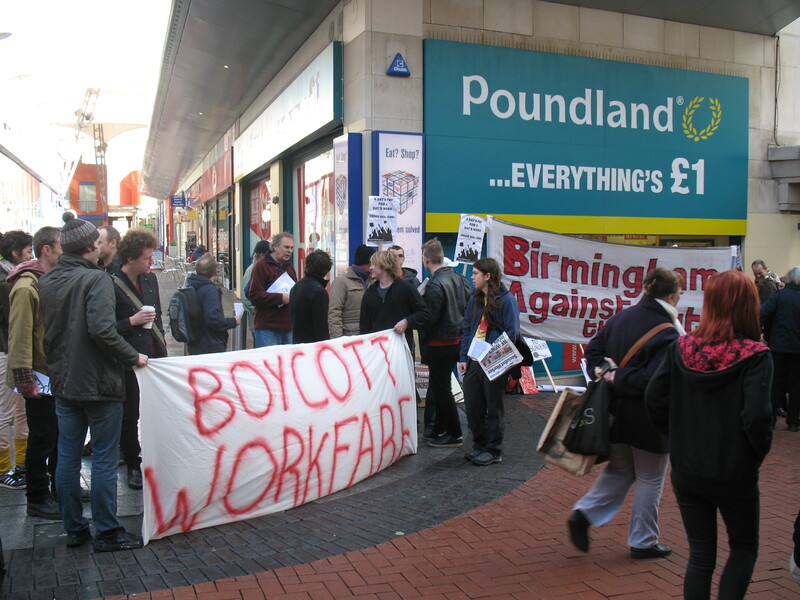 And they are clamping down on job centre staff who try to help claimants, in an effort to break an “appeals culture”, according to internal memos seen by Socialist Worker. People claiming Employment Support Allowance (ESA) can be stripped of it if they are deemed “fit for work” in controversial tests run by companies such as Atos Healthcare, known as Work Capability Assessments (WCA). WCAs have come in for massive criticism from doctors as well as disability campaigners, and almost 40 percent of people who appeal against a WCA decision are successful. The high appeal rate has been a huge embarrassment for the government—as it exposes how arbitrary and unfair their assessments are. But instead of changing the system the government is making it harder to appeal against it. From now on people who wish to appeal must do so by a tribunal instead of through the job centre. Job centre staff have been strictly instructed not to download and print the forms for claimants, but tell them to find the forms themselves from the tribunal service. This is a process that many claimants will find difficult, particularly if they lack internet access and printing facilities or suffer from mental health problems or learning difficulties. Before they can even lodge a tribunal appeal, claimants have to ask the government to reconsider. There is no time limit for this process, and during this time claimants will not be allowed to claim ESA (disability benefit). They can claim other benefits, such as jobseekers’ allowance (unemployment benefit), though this may later be counted against them when they argue that they need ESA. Once they move to tribunal appeal they can claim ESA again—but job centre staff have been told not to make them aware of this right unless they explicitly ask. And WCA decisions are to be sent directly to job centre advisors in the hope that this “contributes to a reduction in appeals” too. Instead of moving the goalposts they should scrap the unfair WCA system altogether. The number of people who have ignored what we’ve been saying for the last 2-3 years and suddenly demanding to know what the hell is going on as soon as it directly affects them… yeah… that’s exactly what we knew would happen. People are too complacent, fall into an “I’m all right Jack!” attitude and tell those of us who can see what is going on that we’re over-reacting or that we’re “extremists” or conspiracy theorists, right up until they are the ones getting kicked in the teeth by this government and their corporate masters. There is such a bloody temptation to say “We TOLD you what was happening! Where were you when we were protesting against the legislation?” Oh, at home watching Britain’s Got Strictly Essex. “It shouldn’t happen to us! We’re not scroungers. We’ve always worked/we’re genuinely sick/we’ve paid our taxes!” is the mournful cry as people realise that the government don’t give a damn who you are, or even that the fraud (and error) rate is only 0.7% (that’s seven people in every thousand claiming disability benefits) – they want to dismantle the benefit system entirely and force people to pay for private insurance (whom would we pay? Oh, companies like the very one that has been advising both Tory and Labour governments for the last 15+ years on dismantling the benefit system and the NHS, what a coincidence). Did you know that some of us call able-bodied people “the not yet disabled”? Iain Duncan Smith’s flagship universal credit reforms will make life for working single parents harder rather than easier, according to a report out today. The Gingerbread charity suggested there would be very little financial incentive for those in or out of work to take on anything more than ‘mini-jobs’. Its findings are a setback to the Department for Work and Pensions, which is aiming to simplify a raft of existing benefits and roll them into the single universal credit in a bid to make the shift to employment a financially attractive one. “The simple fact is that universal credit won’t deliver on its promise to make work pay,” Gingerbread chief executive Fiona Weir said. Non-working single parents will also lose out under the reforms, which the DWP is struggling to put in place before the next general election. Yesterday the scheme began another phase of its national launch with its adoption by Hammersmith and Fulham council – a significantly scaled-back step leading Labour to dismiss the reform as being in “total chaos”. The DWP insists it is making steady progress in rolling out universal credit, however. Gingerbread has suggested increasing the amount claimants can earn before universal credit is withdrawn and reducing the steep rate at which benefits are taken from earnings as ways of making the changes fairer for single parents. The charity also says other steps to help low-income families are not helping single parents either. They are losing out when compared with other households when it comes to increases in the income tax threshold. The DWP said three million households would be better off as a result of universal credit – and that lone parents would gain an average of £5 a month. “Around 500,000 working lone parents will see a greater incentive to increase their working hours and for the first time they will be able to have help with childcare even when they are working for just a few hours,” a spokesperson said. A unanimous verdict at the Supreme Court has judged that the workfare schemes in the Cait Reilly case were illegal. This follows the DWP’s appeal after a lower court had found that the almost all the Government’s workfare schemes were illegal. Iain Duncan Smith was forced to rewrite the law after this judgement retrospectively making these schemes legal. That will not be overturned by today’s judgement, although a Judicial Review has been launched by lawyers questioning the legality of this decision.